Red tide has continued to persist on Florida’s West Coast and Panhandle, according to the weekly report by Florida Fish and Wildlife Conservation Commission. The state agency takes water samples up the west and east coasts to monitor the number of karenia brevis algae, or red tide, in different areas. The agency found high concentrations from Pinellas to Collier counties, as well as Escambia, Santa Rosa, Okaloosa and Gulf counties in the Panhandle. The sample also showed that much of Florida’s east coast is now free of red tide. The red tide had begun to diminish after Hurricane Michael swept up the Gulf of Mexico and landed in the Panhandle, but last week it seemed to roar back. Fish kills were reported in nine Florida counties, and beachgoers reported respiratory issues in the impacted counties. Nick Shay, an oceanographer at the University of Miami Rosenstiel School of Marine and Atmospheric Science, told the Miami Herald that Hurricane Michael might have fueled the most recent rise in red tide. “I kept hearing this argument, ‘Yeah, let’s bring a hurricane and that’ll flush everything out.’ But not necessarily,” Shay told the paper. Shay said that Hurricane Irma last year flushed out red tide in the Keys and Ten Thousand Islands, causing an increase in the fish population. But Michael may have had just the opposite effect. It may have pushed water containing red tide algae into shore, causing the latest surge. The red tide has persisted since October 2017, when scientists from Mote Marine Laboratory first identified it. Last summer, red tides stopped boating, fishing and visits to beaches along much of Florida’s Gulf Coast, from Tampa down to Naples. 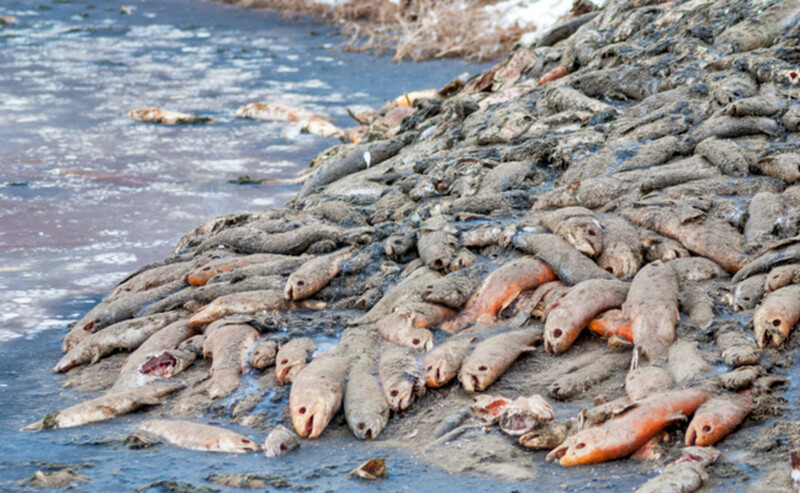 Fish kills became common, with marine animals like manatees, sea turtles and dolphins found dead on the shore. Rick Stumpf, an oceanographer with the National Oceanic and Atmospheric Administration, told the paper that regular seasonal fronts need to arrive in January and February to flush the red tide algae away from shore. That did not happen last year. “We had this nondescript, probably gorgeous weather and the wind not going in any direction,” said Stumpf. The red tide in Tampa has taken a toll on waterfront businesses. Scientists expect it to spread, rather than dissipate.